Category Archives for "Internet Marketing Book Review"
It’s VERY rare that I stumble across a new marketing book that deserves to be in my top 10 list of all time best marketing books. And even fewer get their own Marketing Book Review here on my blog or in my ezine. So I feel darned lucky and excited today to have found a new one. 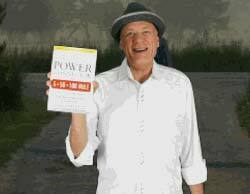 This book can very literally change your entire future in Internet marketing and business. And do it at virtually zero cost. If you think I know anything at all about business or marketing, then buy this book, read it, then do it. By the way, I have millions in sales and approximately 4,000 books in my libraries to back up that statement. Not that I’m boasting…but some people discount everything they read on the Internet unless you slap them over the head with it! lol. Did you get a sense for my excitement in the video? If you did, PLEASE like, comment and share. This is how I know you want me to do more book reviews. If I don’t get comments, likes and shares, then I’ll know you aren’t interested in anymore book reviews. Well, on page 156 Judy quotes a study by Lewis Schiff, executive director of the Inc. Business Owners Council. They surveyed 800 business owners and found that 96 percent of business owners with companies worth $30 million or more believed “knowing the right people’ mattered in their success! Plus, I can tell you from personal experience, staying in the pipeline of information flow in Internet marketing is very important.